The UK government has announced plans to allow driverless cars on public roads from early next year. Business Secretary Vince Cable has shared plans that will see driverless vehicles on UK roads from January 2015. 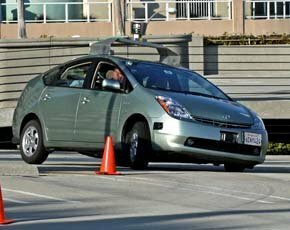 Driverless cars have only been allowed on private roads because of insurance issues, but the new measures could see the vehicles being permitted on public roads as early as January 2015. In California, autonomous cars are permitted on public roads, with Google’s self-driving car having driven thousands of miles already. As part of Cable’s plans, UK cities can bid for a share of a £10m competition to host a driverless cars trial. The government wants to encourage cities to work with businesses and researchers to create proposals describing how they have the facilities to become a test location and how the city can create business opportunities from the technology. Three cities will be selected to host the 18-36 month trials which will start in January 2015. The competition is being funded by Department for Business, Innovation and Skills and the Department for Transport, and in partnership with the UK’s innovation agency, the Technology Strategy Board. Cable tried a driverless car at the vehicle engineering consultancy, test and research facility MIRA. He said: “The excellence of our scientists and engineers has established the UK as pioneers in the development of driverless vehicles through pilot projects. “Through the government’s industrial strategy we are backing the automotive sector as it goes from strength to strength. We are providing the right environment to give businesses the confidence to invest and create high skilled jobs,” he said. The government has also launched a review into road regulations to make sure the UK can benefit and become a leader in driverless car technology. A Forrester paper from last year entitled The Connected Car said that in the next decade autonomous vehicles will overcome regulatory hurdles and enter the market. The paper said driverless-car technology needs approval from governments to allow early testing to begin.